Yep-yep, they is back, ya’ll !!!! Dem chick’n-fries ya’ll was demandin’!!!! WOO!!! To be honest – I remember when these came out years ago and thought they sounded gross and they certainly tasted gross. Floppy and thin. Rubbery and just tired. Now I don’t know if my tastes have changed or the recipe for this because I actually liked these! Yeah – I was surprised too. The breading seems different that what they use on their other fried products. It has a texture to it that flakes off like crumbs or dusting…like a finer-coarse coating/batter is used here. Anyway it works. Granted they were made fresh and I had to wait….Lord knows how they might taste after sitting for a while. I can see kids LOVING these. 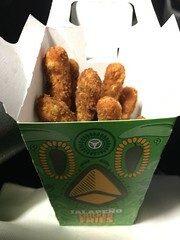 A basket of these mixed in with regular fries? They will probably tear it up. It’s a fun food for certain. I am totally bamboozled as to why I like it…but I do…maybe it’s because the GREAT STATE FAIR OF TEXAS is coming up…and this is totally a Fair-food thingie…and I am just hyped? 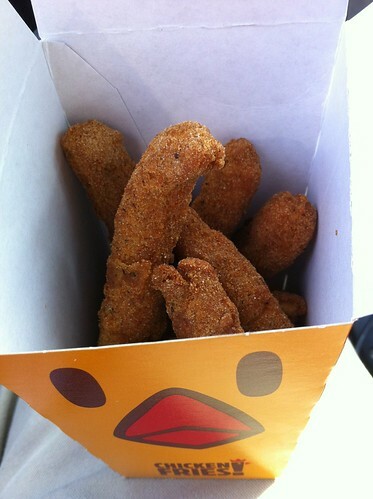 Whatever…just don’t get between me and these here chicken fries. You will lose.